I didn’t make it on the tour of the wineries, nor did I make it to the restaurants for National Wine Day – so much for my plans of Just 4Me. I did however get to open that 1988 Chianti Classico I spoke of. It was quite the event in our household. 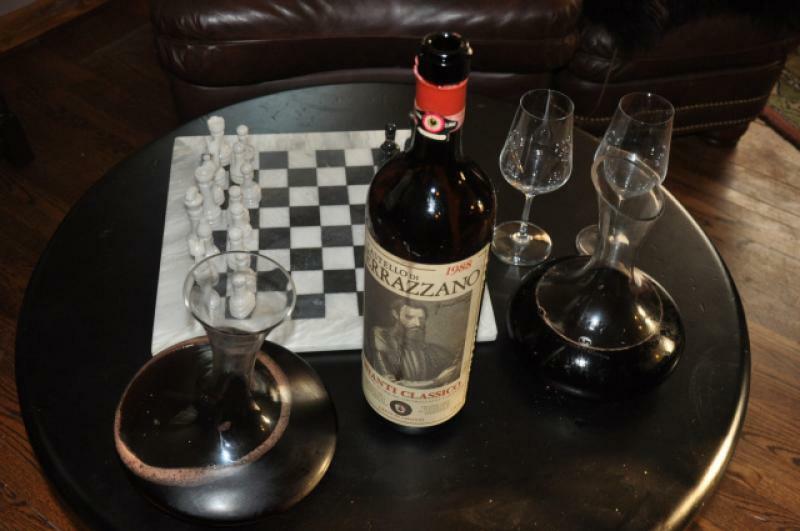 This bottle of wine was given to my partner Bill about 20 years ago as a gift from Domenic at Casa Mia Ristorante. Bill has been diligently turning this bottle for 20 years, keeping it in a cool, dark place waiting for just the perfect occasion to open it. That occasion came Friday night for National Wine Day. The stage was set. The decanters were brought out (it was a 3L bottle, we needed two), the glasses polished, and the table cleared for the photo opps. We took pictures of Bill with the wine, Bill opening the wine, the wine on the table, Bill nosing the wine and ultimately Bill’s expression after tasting the wine…. I think you can see for yourself how good this wine was. And after all that, we sat down to the perfect prime rib roast to enjoy the wine with. All in all a great night – a night for all instead of Just 4Me! But – a good night in all! I've been impressed with her swiftness in getting the job done as well as her helpful suggestions on how we can improve our online presence and social media.